CHOOSING NEW PAINTBRUSHES DOESN’T HAVE TO BE DIFFICULT – BRUSH SHAPES. 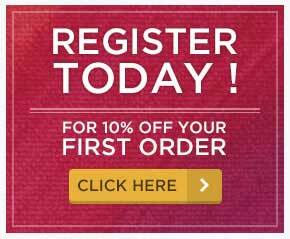 It can be daunting going into an art shop or ordering online and being faced with the seemingly endless number of different brushes from which to choose. 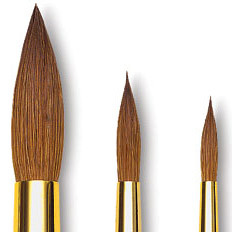 A good set of brushes will make the most of your paints and choosing the shape of a brush is probably the first step. Paint brushes have been used since the age of cave painting. Animal hair was bundled and fastened to a handle. In ancient Egypt reed stalks and reed fibres were beaten at the ends to make brushes. Artists made their own brushes right up until the 16th century. For several centuries brushes could only be round due to their construction using the quill of a feather. 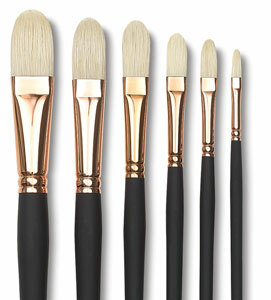 However in the 19th century, brushes could be made in various shapes due to the introduction of metal ferrules. The Impressionist turned the art world on its’ head with the new mark-making options that new brush shapes offered. Today there are many new shapes available. Hopefully our list will help make your choice simpler. The Round brush is good for: sketching, outlining, detailed work, controlled washes, and for filling in small areas. You can create thin to thick lines – thin at the tip, becoming wider the more you press the brush down. Use with thinned paint, rather than thick paint. A pointed round is narrower than the round brush and has a sharply pointed tip. It is good for: creating fine details and lines, delicate areas and for spotting and retouching. This brush has round hairs that are shorter in length and has a shorter handle. It is good for: details and short strokes and it holds more paint than you might think! A long haired brush which is angled to a sharp point at the end. This brush is good for: creating long smooth lines, ideal for painting plants and leaves, it is adaptable and can be used to create both thick or thin lines using different parts of the brush. The Flat or Gussow brush has a square end with medium to long hairs. It is good for: filling wide spaces, for impasto and you can use the edge for fine lines, straight edges and stripes. Long haired Flat brushes are also ideal for varnishing. These brushes are flat with edges curved inward at the tip and have shortish hairs. They are good for: short controlled strokes, thick heavy colour and are better for working up close rather than holding the brush at a distance from the canvas. The Gussow is made by binding two bent bundles of hair together in the ferrule, so that they are curved towards each other. This brush has the same uses as the regular Gussow brush. However an Interlocked brush is less likely to have hairs sticking out. Filbert or Cats Tongue brushes are f lat, have an oval shaped end with medium to long hairs. They are good for: blending and have soft rounded edges like flower petals. This brush is a sort of combination of round brushes (because it can be used for detail) and flat brushes (because it can cover more space than a round brush). Fan brushes have flat, spread hairs. Natural haired fan brushes are good for: smoothing, blending and feathering, synthetic haired fan brushes are better for textural effects and are great for painting clouds and leaves on trees. For acrylics, use a strong and sturdy one, otherwise the hairs will clump when paint is added. These brushes are flat with angled hairs at the end. They are good for: curved strokes and filling corners and you can reach small areas with tip. 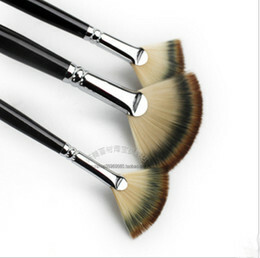 They can also be used to cover lots of space, similar to flat brushes. The Reservoir brush is made up of two different bundles of hair, set together. There is a long thin bundle in the centre surrounded by a shorter bundle. The outer bundle acts as a reservoir, feeding the paint into the inner bundle. It is good for: fine detailed work and has the benefit of allowing you to work for a long time before having to dip into your paint again. Liners or Riggers are brushes which have extra long hair. As you move the brush handle, the hairs follow in a wiping motion. These brushes are good for: painting long lines and stripes. They can hold quite a large amount of liquid. There are round and flat versions. Flat Liners are also known as Lettering brushes. An Oval brush, also known as a Bombe, is a flat brush with an oval tip. It is good for: using as a wash brush. So which brush do you think you will go with? 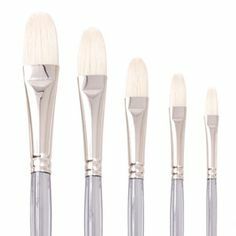 As you can see there are many different types of brushes for various different techniques, and using the right brush will no doubt aid and improve your skill and enjoyment from painting. Come in-store to browse our wide selection; we will have the brush for you. This entry was posted in Blog Home, Articles and tagged art materials, brushes, painting on November 29, 2016 by Zsofia Jakab. Do you know these paint brands? Have you seen these brands in a shop, but are not sure if they are suitable for your work? Or perhaps you wanted to paint as if you were a Dutch Master, or Vincent Van Gogh himself? Curious what's the difference between professional and student quality paint? Keep reading and get to know why it is so accurate to name the brands after these two particular painters, and why you should probably try them yourself. Why use The Royal Talens Rembrandt brand? Big range of colours (120), traditional, deep and very strong. The pigments are ground very fine, containing the highest concentration possible, thus good for creating smooth surfaces and blending colours. Highest degree possible (+100) years under museum lighting conditions). make sure to check the little square signs on the tube; they indicate the opacity from transparent (white) to opaque (black). Lead Tin Yellow – used until the 18th century. The closest is possibly the mix of Cadmium Yellow Lemon and Transparent Yellow Green. Lead White – Unfortunately, because of the poisonous pigment it’s not manufactured by the series. It’s supposed to be the warmest tone white paint. Alternatively the same results can be achieved with the mix of Titanium White and Zinc White (to reduce the opaqueness of the Titanium) mixed with a bit of Naples Red to achieve the desired effect. 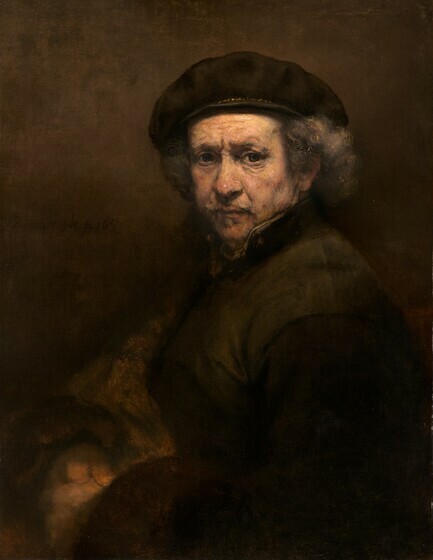 In his paintings, Rembrandt used this technique to enhance the effect of wrinkled and detailed fabrics, jewellery, or to give highlights a more prominent look. Van Gogh is known for his unique colour use and neurotic lines which made his works stand out of the 'regular' impressionist style. He wasn't appreciated in his lifetime, but now his name has come to represent the 'student quality' (although in some countries it is considered so good that it is artist quality) paint brand made by Royal Talens. And not by accident! Why Use Royal Talens Van Gogh oil paint? Less colour shades than Rembrandt (66), but they produce a more “modern” range, in 2 price series, the result being a student quality price with an artist quality colour choice. High level, finely ground pigments (not as fine as Rembrandt) fantastic for keeping brushstrokes visible. High level, excellent in keeping the colour over a long period of time (75- 100) years under museum conditions). Van Gogh’s early works clearly show the resemblance to traditional Dutch painting: dark, earthly brown tones – probably influenced by his tutor, Anton Mauve – were more characteristic of Rembrandt perhaps than the light colour palette of late 1800’s popular Impressionists. However, after a while Van Gogh's palette indeed went through a radical change as he allowed the popular style of the age influence his work - he switched the dark colours to that of impressionist ones: this meant that he no longer used browns, blacks and greys, but instead worked with richer brighter colours characteristic of the Impressionist style. They tried to capture the colour of their subject in natural light, using colours directly out of the tube, creating such an effect that the different pure colours next to each other would show a mixed effect on the canvas. This is particularly prominent in Van Gogh's later - and most popular - paintings. Whats was Van Gogh’s colour palette? So, whats it going to be, Rembrandt or Van Gogh? All in all, it seems that there is not much of a difference between so-called artist quality and student quality paints. Like most things in life, it is the subtle differences that can make big differences. Perhaps the most important thought that counts is how you use the paints and knowing exactly what you're looking for in terms of colours and pigment fineness. What is also important to note that while many popular brands now manufacture their paints in China, The Royal Talens brands keep up the quality by making their paints in The Netherlands. 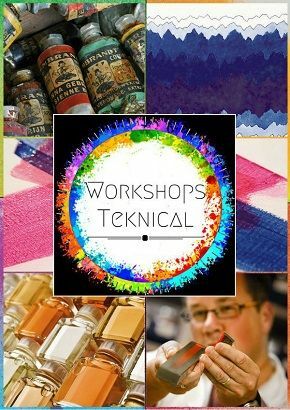 Therefore, it seems that even if you are looking for either student or professional quality, Van Gogh and Rembrandt are a good choice with their wide range of colours and high quality products. I would recommend Van Gogh for fellow art students because of the good quality and affordable price! And what can I say about Rembrandt? Well, having had the chance to get a taste of what a professional paint is like, I do want more - you have to try it in order to fully understand! Perhaps, get some as a holiday present, or just simply treat yourself because you deserve it! If this brief introduction of the artists and their techniques made you interested, keep your eyes on the blog to learn more about them in the future! This entry was posted in Blog Home, Articles and tagged rembrandt, rembrandt oil, van gogh, painting, impasto, impressionism, Royal Talens, van gogh oil on November 21, 2016 by Zsofia Jakab. Try something different for texture! It’s always nice to try something different with your paintings. I sometimes use tissue paper to add texture to my watercolours. It’s a really simple technique and very effective. Cover your painting surface with a thin layer of PVA mixed with a little water. Scrunch up your tissue paper and then lay it on the PVA surface. Cover the tissue paper with another thin layer of the PVA water mixture and leave to dry. You will end up with a nice crinkly surface to paint on. Alternatively, draw out your design on your stretched paper/canvas Choosing different colours of tissue, scrunch up your tissue, tear into the rough shape of the area you want to fill and stick on the piece of tissue. Keep doing this until you have filled every section of your picture. Cover with a thin layer of the PVA water mixture and leave to dry. 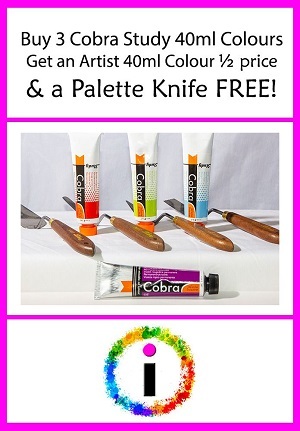 Now you can work into your picture with your paints. It’s all up to you and your imagination now. How about trying the same technique with lace or paper doilies? Or maybe netting or string. This entry was posted in Painting In Watercolour, Ideas & Inspiration and tagged watercolour, texture, tissue paper on November 15, 2016 by raxxar.